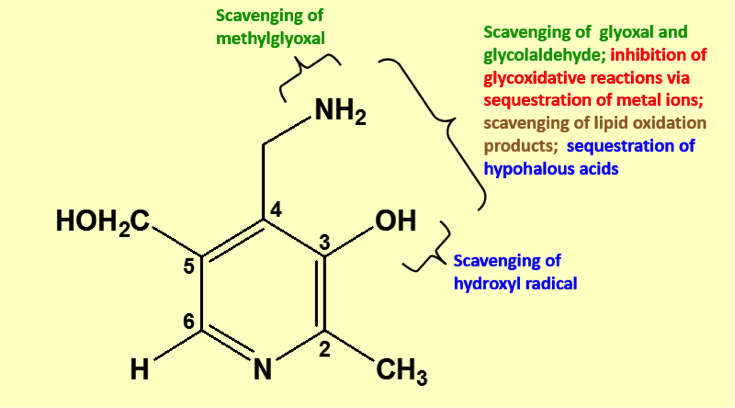 The compound has a distinct structure and is comprised of a pyridine ring containing hydroxyl, methyl, aminomethyl, hydroxymethyl and phenol substituent groups. • Redox metal binding activity (e.g. copper (Cu2+), manganese (Mn2+), and iron (Fe2+)), which inhibits the oxidation of Amadori intermediates to AGEs.